I frequently see examples of electrical system work in which wires are cut, stripped back & twisted, etc. in order to make connection to an existing circuit. 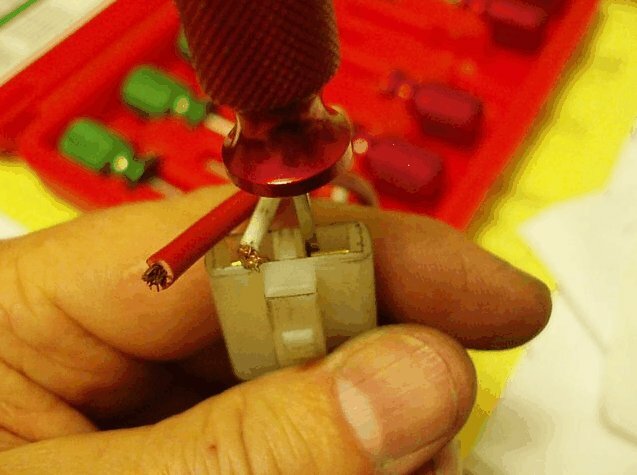 In other cases, a terminal is making poor contact but has not been serviced in order to remove corrosion or tighten the "grip" of the connection. Most terminals whether spade, or miniature bullet, etc. 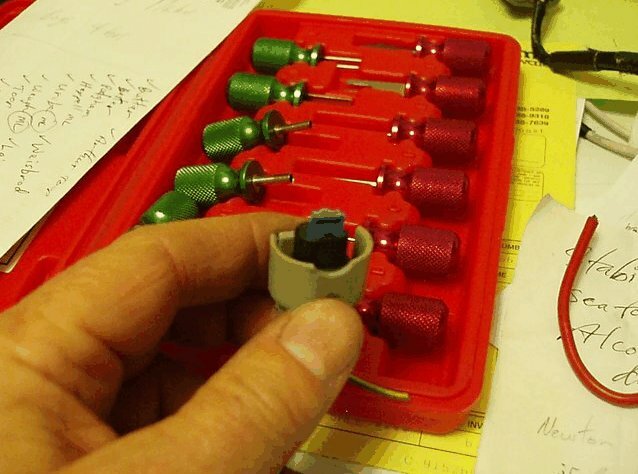 which are installed as original equipment on motorcycles or automobiles use some fairly standard configurations in which the connectors are held into a plastic plug body. In most cases these connectors can be readily removed from the plug body in order to attach an additional wire, clean or tighten the connector, or replace the connector. 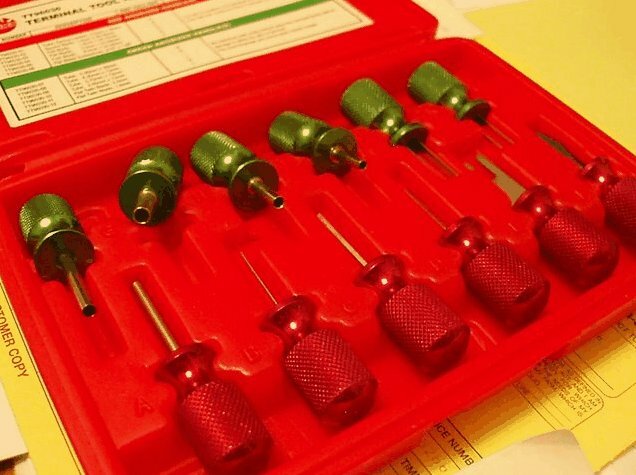 Terminal tools of various types are available to depress the locking tab on the terminal. The tool illustrated is intended to depress the flat blade terminal on flat bodied connectors. There are several widths & thickness of tools. 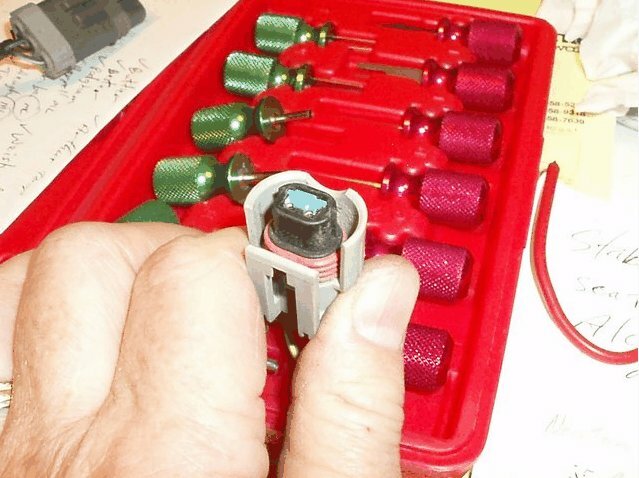 The terminal tool is inserted into the plug body in order to depress the locking tab. 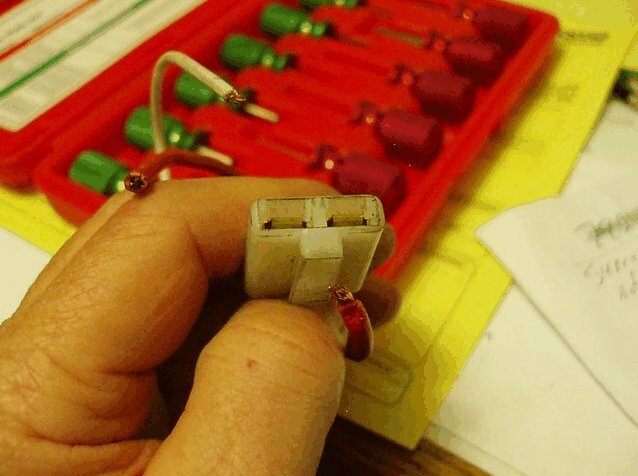 This tab is usually in the form of a blade which swings out from the terminal to engage the plug body. 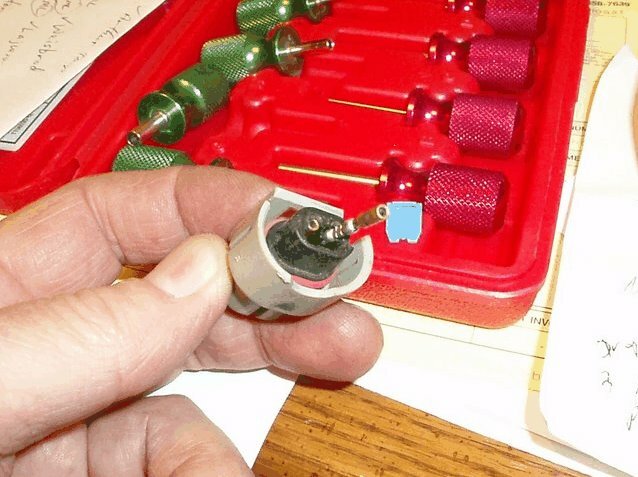 Note that it is usually best to push the terminal firmly into the plug body so that the end of the locking blade comes free of the ledge in the plug body. Some plug bodys have a raised lip or pocket into which the terminal's blade fits to it is difficult to impossible to press the blade flat without damaging the blade unless the end of the blade is pushed past the lip. In the following photo, note that the blade is being bent outward again in preparation to reinstall the terminal into the plug body. It is best not to bent the blade out further than necessary because over bending can snap the blade. Here is a photo of the terminal from the ABS Warning Light Module plug. Note the top right terminal which is recessed as this was likely the cause of the intermittent connection which was plaguing my right hand ABS warning light. Press the terminal out, reset the blade and reinstall. If wishing to have another wire attached, I will remove the terminal and solder a second wire along side the first, then re-install. These slide over the tubular type terminals in order to depress the locking tab(s). I will try to remember to find and post some examples. Another type of plug and terminal is seem below. This is a common type automotive connector of the Weatherpack and similar types. Note the red rubber sealing gasket. 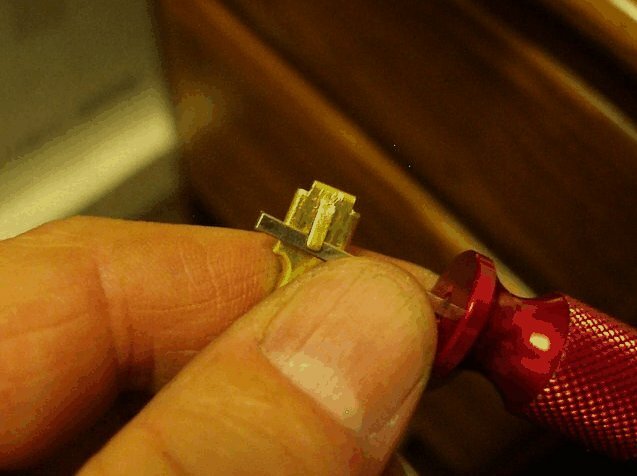 This uses a tubular type but the terminals are locked by means of a wedge block and a lip on the end of the plug. Note the blue colored wedge block in the end. 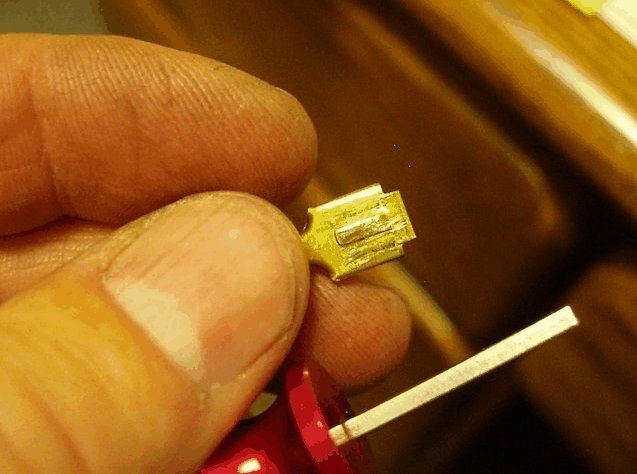 Next is a shot of the plug with wedge block removed and one terminal extracted. In this style plug, the end of the terminal needs be deflected away from the lip on the other side of the body as can been seen obscuring an arc of the end of the other terminal. When clear of the lip, the terminal can be pushed out, usually by pushing on the wire. There are other types but so many that is would be impractical to try to post them all. 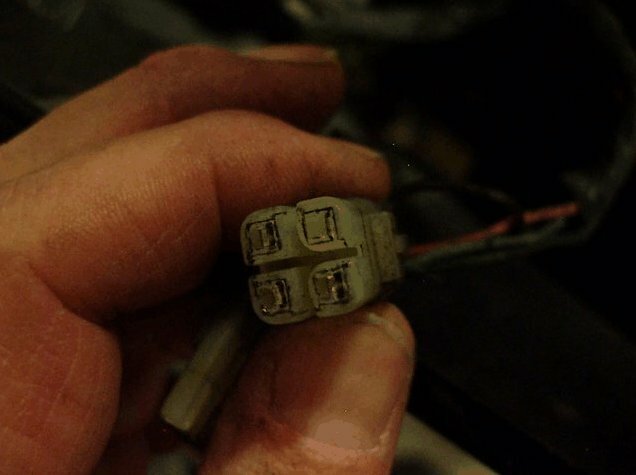 I recommend that anyone who has not done so, look for some used wiring plugs of the types used on the ST. These are commonly available from bike wreckers as parts of damaged wiring harnesses. These are good to use for practise. 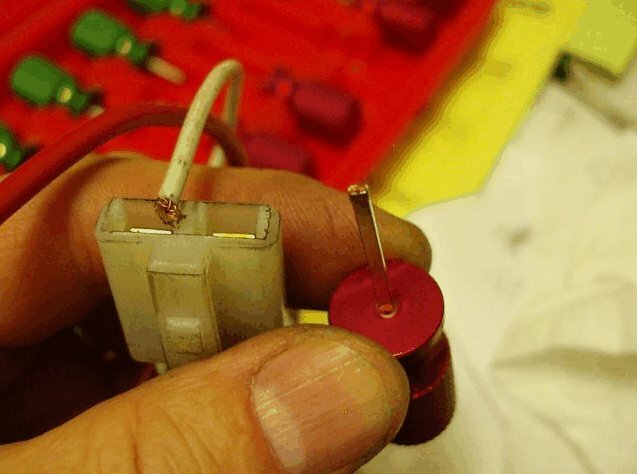 My thread entitled: "Headlight Ground Circuit Modification" describes soldering wires to the spade lug type terminal.